Gettysburg: The Tide Turns is the latest strategic wargame for the iPad and iPhone being developed by Shenandoah Studio. Shenandoah are the makers of the superb Battle of the Bulge iPad wargame that I have raved about so often here and selected as one of our picks for Best iPad Apps of 2012. Gettysburg commemorate this great battle with an historically accurate iOS strategy game integrated with extensive historical commentary, period photographs, maps, and music; an engaging iOS strategy game that also enhances your understanding of battle and the sacrifices made there. — Gettysburg was an epic and significant battle – as the game’s name suggests, it is widely considered to be a turning point in the Civil War. In Gettysburg, unit morale represents the unit’s training, dedication, and experience. Brigades with high morale can withstand withering fire that would send a lesser formation skedaddling home. — Period units in the game will include infantry, cavalry, and artillery. Eric Lee Smith is an award winning game designer and veteran of both Simulations Publications (SPI) and Victory Games. He has designed games on many topics and periods, including: Across Five Aprils, The Civil War, The Alamo, and Ambush!. He has also worked as a software designer for over 20 years. In designing Gettysburg: The Tide Turns he brings his experience with Civil War games and software design together to create a new and polished game for iOS. 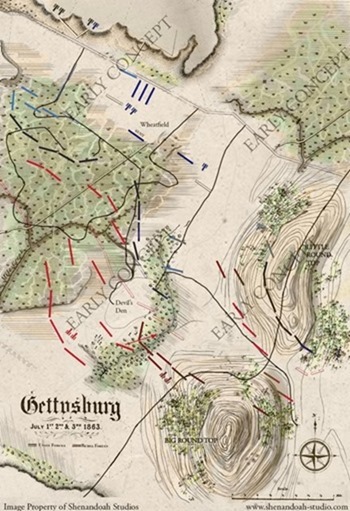 — A Gettysburg board game is one of the very first games that got me hooked on wargames as a kid. I have fond memories of playing that one and taking on this great battle on the iPad will be a real treat. The Kickstarter page for Gettysburg: The Tide Turns is full of lots more detail on the project, including some great stuff on the early concept art work for the game. Inspired by period maps, newspaper illustrations, other official correspondence, the art team responsible for Battle of the Bulge is hard at work on graphics for Gettysburg. Piles of maps and books litter the office as we define and collaborate on an art style that combines historical feel with digital polish. I love how Shenandoah are taking the very best of traditional board wargames and bringing them to the iPad and iPhone, and that they are planning a number of new titles from various eras. Of course I’ve backed this Kickstarter project this morning and it’s fantastic to see that it’s already at almost half its funding target after just a few hours. 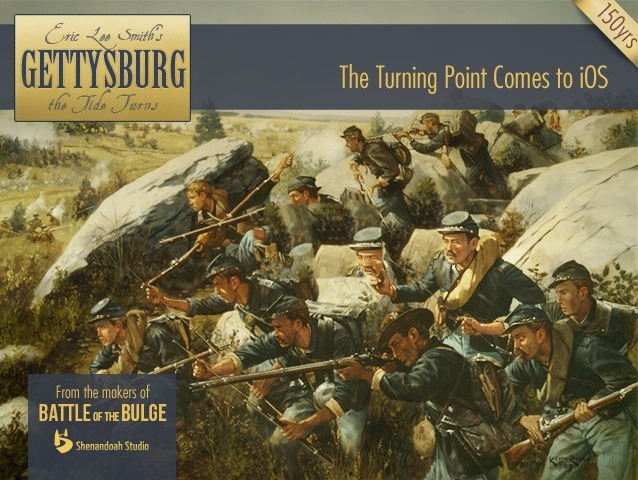 Check out the Gettysburg: The Tide Turns Kickstarter project page to learn more and get in as a backer to support this great development team and earn some very cool rewards.